Homepage. This page: A black and white photograph showing a large touring car parked outside a country cottage. John sent this old family photograph over early in 2008, wondering if I could identify the car in the picture. It looks like an Armstrong Siddeley to me, although I'm not sure on the model so if anyone can advise, please let me know! 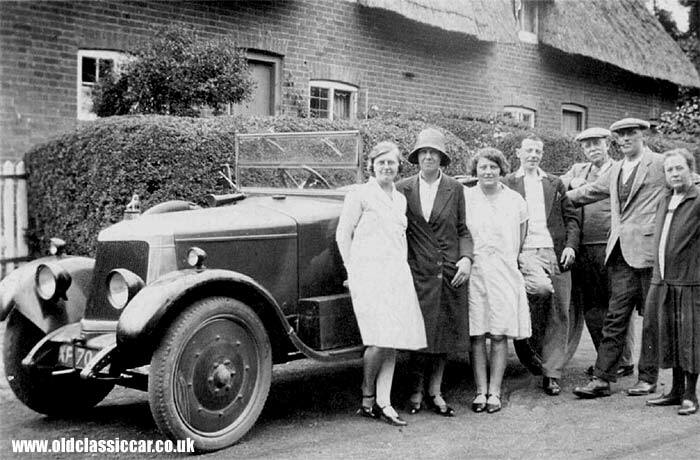 John's father in law, Stanley, is fourth from the left in this view of the tourer, parked outside a traditional country cottage, complete with thatched roof. There are two giveaways to identifying this car as an Armstrong Siddeley - firstly the V-shape of the radiator, and secondly the sphinx mascot attached to the top. Also note the distinctive style of road wheels, the split windscreen and also the box (a toolbox perhaps?) sat on the nearside running board of this early 1920s/30s motorcar. A later Armstrong Siddeley, this time a post-war touring car, can be seen on this A-S Hurricane page, with a parts noticeboard covering many Armstrong Siddeleys on this page. As a footnote, I've seen several spellings for this car manufacturer - eg Armstrong Sidley, Siddely, Sidelley or Siddley, but the correct one is Armstrong Siddeley. For more about these quality cars, have a look at the owners' club website. "I think that you are a bit too modern putting early thirties on this car. The unusual wheels just made it into the thirties on the 15/6 but I think that this is a mid twenties 18. There is a scuttle fuel filler for a gravity tank, those wheels, and a Klaxon by the driver's windscreen. I have memories of three A-S cars, a Typhoon owned by a man round the corner in the late 1950s, but more importantly a 1950 Whitley GBO 838 owned by my favourite Uncle, black with a brown leather interior and a pre-selector box with centrifugal clutch, which he followed up with a 1953 Sapphire 346 four light saloon NYO 817 two-tone dark over light green with a green leather interior and the manual gearbox. The Whitley was referred to as "the gutless wonder" since they were not particularly quick off the mark, but the Sapphire certainly went a bit with its 3.4 litres. The Sapphire was exchanged for a 1953 Bentley R-Type Standard Steel Saloon in sand over sable with tan leather. Now, 44 years later, the Bentley sits in my garage waiting for me to start the rebuild by re-fitting the completely re-conditioned engine". Thanks for getting in touch John! A photo of the larger model of the time can now be found on the 30hp Armstrong Siddeley photo page.